Dies ist eine schöne 3300 sq. Ft. Rocky Mountain Lodge-Stil Hütte. Der Innenraum ist mit riesigen Holzbalkendecken fertig, dass die Spannweite 30 ft. Hoch und führen die über die gesamte Länge der Decke. Die Innenwände sind mit Knotty White Pine durch-aus die gesamte Kabine und ein River Rock Gas-Kamin ausgestattet, das die bis zur Decke Ebene laufen. Dies ist ein 3-Ebene Kabine mit überdachten Deck und einen herrlichen Blick auf das Gebirge. Um in Komfort sich vollständig entspannen und immer noch den Atem genießen Blick nehmen aus dem Inneren unserer Lodge, haben wir insgesamt 300 sq. Ft. Von riesigen Glasfenster der das 30 ft steigen. In die Luft! Ein voll ausgebauter Keller ist ebenfalls vorhanden, damit Ihre Kinder Pool spielen können, und einen Fernseher mit Satellitenanschluss. Murphy hat jetzt einen Stil Casino in Las Vegas. Nur eine kurze 10 Minuten Fahrt von unserer Hütte. Versuchen Sie Ihr Glück, Ihren Urlaub können sich permanent! 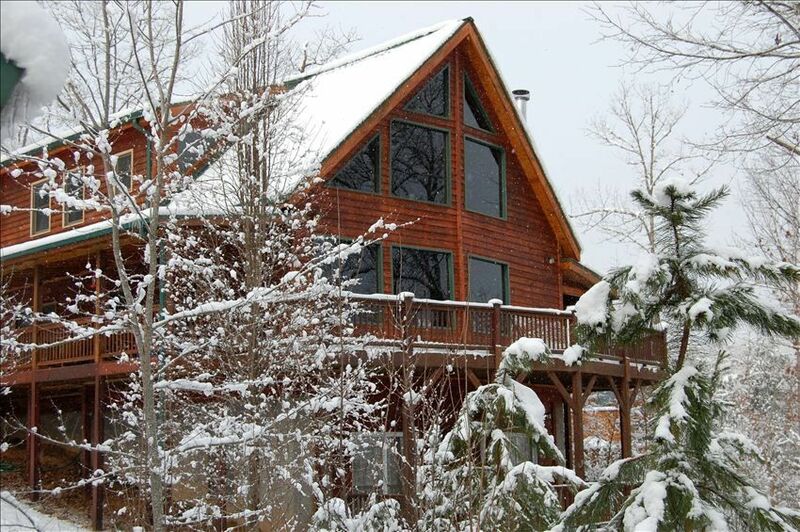 This was a perfect place for our three families to come for Thanksgiving holiday! The scenery is beautiful which can be enjoyed from multiple decks or through the huge windows in the living room. The open kitchen made it great to hang out with family while everyone cooked. The playroom in the basement was perfect for the kids! The fireplace was lovely to enjoy after hiking in the cooler weather. I think the only small drawback was some of the beds were a little hard to sleep on but we looked at this like camping (in luxury of course!) and we couldn’t be happier with our experience in this gorgeous cabin. The cabin was perfect for our family getaway while in Murphy for a wedding. Lovely scenery. House had everything we needed with plenty of space for the whole family! needs better detsiled cleaning. numerous kinds bugs in windows seals! Side porch was unkept. The cabin was everything we wanted. We ended up here last minute and we were very happy with our choice. The owner was very nice and made sure we had all the information we needed. We will definitely recommend this property to anyone coming to the area. The cabin was beautiful and the view was breathtaking , the kitchen had most things one would need in a kitchen. The beds were comfy , lots of natural light , I would recommend bringing a blindfold for sleeping in if you are some one who likes waking up later . This trip really made memories for me and my wife. This cabin was way more than I ever expected! Perfect location, perfect view, felt at home as soon as we walked in. More space than I could ever imagine. Came with everything I would have in my own house. I can't say enough good things about this Mountain Top Cabin. I wish we never had to leave. Can't wait to go again! !